Nonfiction/Essay by Donal Mahoney: "My Parents Were Illegal Irish Immigrants in the United States"
Donal Mahoney lives in St. Louis, Missouri, an immigrant from Chicago. Amid the hubbub in the United States today over illegal immigrants, he remembered that his parents were illegal immigrants from Ireland a long time ago. They came because of the freedom the United States offered. Technically they were illegal but his father had no choice but to come and his mother likely did not know she was illegal. This is their story. Fiction by Muhammad Nasrullah Khan: "Eternal Freedom"
Three poems by Robert Beveridge: "Freedom," "Liberty" and "Liquid Prisoner"
Three poems by Lazola Pambo: "I Am of This Gender," "Sexual Discourse," and "The Dignity of Human Rights"
Lazola Pambo is a South African poet, novelist and essayist. His poems have been published in “The Kalahari Review,” “Aerodrome,” “New Coin,” “Nomad’s Choir,” “Black Magnolias Literary Journal,” “Sun & Sandstone,” and “Aji Magazine,” among others. You can follow him on Twitter @LPambo. 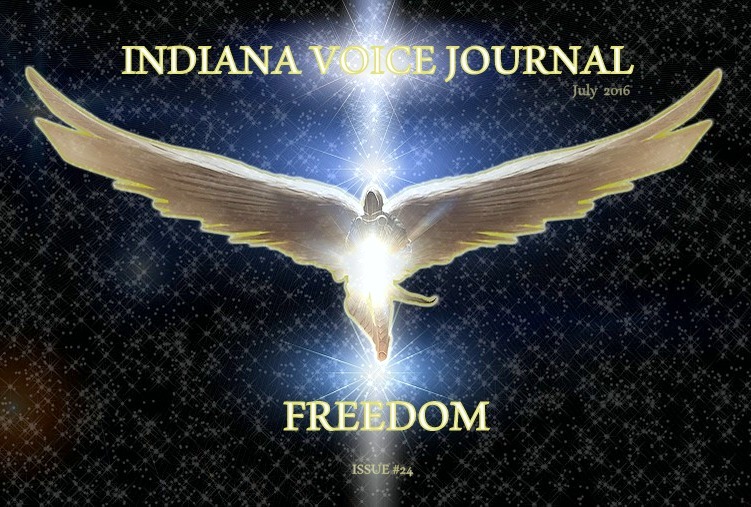 Three poems by David Allen: "What is Freedom," "Freedomland" and "Preparing for the Reunion"
David Allen is a freelance writer and poetry editor of Indiana Voice Journal. He was born in South Carolina and raised on Long Island, NY, which is enough to make anyone a bit crazy. He is a former sailor, war resistor, and journalist, writing for newspapers in Virginia, Indiana, and the Far East before retiring to Central Indiana. His poems and short stories have been published in several journals and he has two books of poetry, "The Story So Far," and "(more)," both available from Amazon.com. He has a blog at www.davidallen.nu and is an active member of the Last Stanza Poetry Association in Elwood, Indiana. Three poems by Denise Segal Umans:"The Limestone Quarry," "A Township after Apartheid," and "Gaudi's Parc Guell"
Denise Segal Umans grew up in South Africa and now lives in the Boston area. She is a consultant in applied linguistics and teaches English as a second language. Her poetry has been published in Poetry Quarterly, Clementine Poetry Journal, Clementine Unbound, and The Avocet: A Journal of Nature Poetry. Three poems by Ryn Holmes: "All-American," "Gray Socks," and "Isolata"
Ryn Holmes is an award-winning poet and photographer, originally from California and now residing along the Gulf Coast of Florida. She is a published writer with works appearing in the Emerald Coast Review, Syzygy Poetry Journal, Four and Twenty zine, and Longleaf Pine magazine. Pramila Khadun is a poetess from the island of MAURITIUS she had four collections of poetry entitled "Rajnee", "Priyumvada", "Kavi" and "Igniting Key". Igniting Key was a joint publication with Dr Ampat Koshy and Dr Bina Biswas. Currently her next collection entitled "Le Shangrila" will soon be under print. she has also written a novel entitled "When love speaks" and a book on Food and Nutrition. she has been the winner of International Reuel Prize for Writing and Literature for year 2015. Married to Raj, she lives with her children Dr Rajnee and Priyum and Captain Kavi. Two poems by KJ Carter: "Alas, to be Truly Free" and "A LIfe in the Great War"
Kathy Jo Carter is a nurse and life resident of Madison County. The Arts are a passion, but her biggest passion is her grandchildren and great grandchildren. She is a member of Last Stanza Poetry Association of Elwood, Ind., and St. Mary’s Catholic Church. Three poems by Marcia Conover: "Independence Rings," "Summer Visitors," and "Seasons of Color"
Marcia Conover was born in Indiana and grew up in a small farming community in northern Madison county. She has been writing short stories and poems since grade school, but didn't share her poetry until her mother's death in 2015. She is married with 2 grown children and lives on a small farm where she has owned and operated a state-licensed child care center since 1984. Three poems by Elizabeth P. Brooks: "Cry Out," " My Freedom," and "Oh Freedom." Elizabeth P. Brooks is originally from Trinidad and Tobago and now calls Tampa Bay home. She is deeply concerned about human dignity and the need for social justice. She is outgoing, loves the sound of laughter and the power of the word. She is a performance poet and has had several poems and two non-fiction essays published in Indiana Voice Journal. She is the author of a recently published chapbook ,“You May Applaud Now and other poems” and she is currently working on a novel and many other projects. She is a reference librarian at Saint Leo University in Dade City, Fla., and volunteers as an adult literacy tutor in Tampa.